The change includes the ability to extend Boeing’s CFT from roughly two weeks to up to six months as well as the training and mission support for a third crew member. Cargo capabilities for the uncrewed and crewed flight tests were also identified. 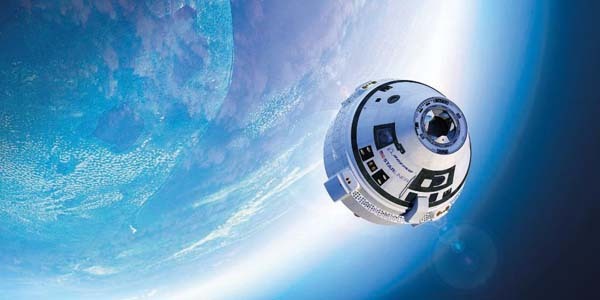 Exact details of how to best take advantage of the contract modification are under evaluation, but the changes could allow for additional microgravity research, maintenance, and other activities while Starliner is docked to station. Adding a third crew member on Boeing’s flight test could offer NASA an additional opportunity to ensure continued U.S. access to the orbital laboratory. The current commercial crew flight schedules provide about six months of margin to begin regular, post-certification crew rotation missions to the International Space Station before NASA’s contracted flights on Soyuz flights end in fall 2019. This would not be the first time NASA has expanded the scope of test flights. NASA had SpaceX carry cargo on its commercial cargo demonstration flight to the International Space Station under the Commercial Orbital Transportation Services (COTS) initiative in 2012, which was not part of the original agreement. As part of its normal operations planning, NASA has assessed multiple scenarios to ensure continued U.S. access to the space station. The agency is working closely with its commercial partners and is preparing for potential schedule adjustments normally experienced during spacecraft development. Boeing and SpaceX plan to fly test missions without crew to the space station this year prior to test flights with a crew onboard. After each company’s test flights, NASA will evaluate the in-flight performance in order to certify the systems and begin regular post-certification crew rotation missions. Good luck to the Boeing/ULA/NASA team! WSJ notes that this apparently blended Boe-CFT/PCM-1 mission won’t happen until 2019 or 2020. Good Idea. just read that Dragon2 is getting FAA aproval to land in Gulf of Mexico.No sonic boom maybe for Fl. Calmer seas, closer to Houston. I was hopeing for Lake Okechobee. If SX is ready this year, then NASA will use Boeing or force them to wait? Just surprised that they are not cutting same deal with both of them. I was thinking of returning astronauts to JSC rather than KSC. May not be any better. Do note that SpaceX isn’t ready until NASA says they’re ready. The fact that this announcement only applies to Boeing’s capsule and not SpaceX’s capsule is more than just curious.